bobo is a new room air purifier concept based on the same filter technology of Totobobo mask. 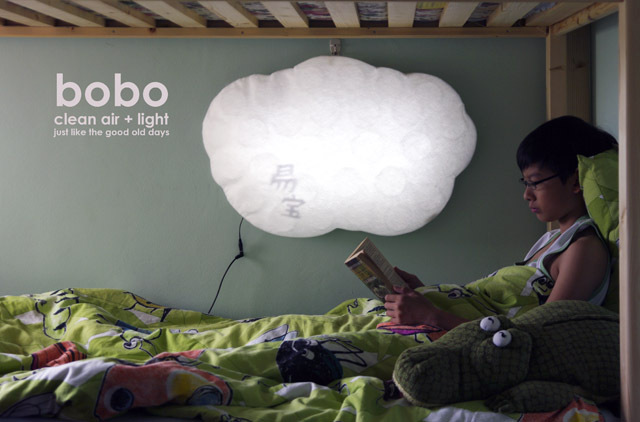 A unique feature of bobo allow it to double up as a diffused light, easy on the eye when use as a reading lamp. It is particularly suitable for the bedroom of children with asthma or sensitive respiratory track. We are completing 8 functional prototypes to be exhibit in the Singapore National Museum. The public exhibition “Imprints: Designing from memories” will start from December 4th and end by the 2nd of January 2011.